What gives Cheddar its unique texture? As Cheddars age and mature, they undergo not only a change in flavour but also in texture. With each year of aging, they lose moisture, making the interior drier and more crumbly, and the salts and acids more concentrated. This results in two wonderful new characteristics: the flavour becomes sharper, with more “bite” to it; and the salt gives the cheese a crunchy texture. The “crunch” comes from a natural tendency of salt particles to bind with each other to create larger particles. Beginning around the third year of aging, these particles starts to form into “lactate crystals.” Small at first, they become very noticeable grains in the cheese at around 5 years. Since every vat of Cheddar is slightly different from the next, the size of the crystals will vary. So if your Cheddar crunches, don’t worry. It’s a natural and desirable result of the aging process. What is the difference between orange cheddar and white cheddar? Many people think that bright orange is the natural colour of Cheddar. Not so. Natural Cheddar gets its colour from the milk that it was made from, and that milk has a warm, creamy hue. That hue, however, varies with what the cows have eaten – summer grasses or winter feeds, for instance. So in the 1900s, cheese makers began adding colour to Cheddar in order to standardize the appearance of the cheese. The practice grew in popularity, resulting in the bright, nearly pumpkin colour many people associate with Cheddar today. From a taste point of view, adding colour makes no difference. However, after about two years of aging, the formation of salt deposits becomes much more visible against a bright orange background versus a creamy hue. That’s why you don’t see orange colouring in 3 to 5 year old Cheddars. In Balderson Cheddars, the only colouring agent we use is Annatto, a natural plant extract similar to a ground carrot seed. It’s ideal for people who have sensitivities to artificial food colourings or synthetic food dyes. Why are cheeses high in fat? The fact is that cheese retains the high fat content of its main ingredient, whole milk. But it’s not all bad news. Cheese also delivers all the nutritional benefits of whole milk. And milk fat content is the delivery system for flavour; higher fat contents mean more flavour and a creamier texture. Cheddars, by the way, have a fat content of 32%. To find the fat content of any cheese you buy, check the label. You’ll see the percentage of fat next to the M.F./M.G. How much trans fat is there in cheese? Trans fats occur naturally in all dairy products. They’re produced in the rumen of the cow and are a part of the milk. The resulting trans fat levels in cheese and other dairy products, however, are extremely low (0.3 grams per 30 gram serving in Balderson Cheddars) in comparison with food products containing industrially produced trans fats that are created when vegetable oils are partially hydrogenated. What's the nutritional value of Cheddar? Since Cheddar is primarily made from milk, it contains all of the natural goodness and nutritional ingredients of milk: calcium, proteins, minerals and vitamin A.
Balderson Cheddars are also good for what they don’t contain: we don’t use any artificial ingredients, modified enzymes or colourings. Our cheeses are aged naturally and selected at their peak in flavour, taste, aroma and texture. What should I do if my cheese gets moldy? Hard cheeses like Cheddar have a low moisture content and high levels of salt and acids. These two factors help inhibit mold growth and protect the cheese. Mold still can occur on Cheddars but it’s usually due to external factors like exposure to spores in the air, or to contamination from cutting boards, counters or even hands. That’s why mold forms only on the outside of a Cheddar block. If mold forms on your cheese, it’s always best to discard it. Some types of cheeses, including Stilton and blue cheeses, develop safe molds that have been carefully formed and introduced as part of the maturation and development process. But this isn’t the case with Cheddar, nor with softer cheeses where mold contamination can easily migrate into the cheese through natural moisture. As a general rule: if your cheese is moldy, discard it. What are the ingredients of Cheddar? Along with growing consumer interest in the nutritional values of foods has come an interest in ingredients. With most cheeses, the list is very basic and natural. Balderson Cheddars contain only milk (of course), bacterial culture (think of yogurt), rennet (a coagulant that starts the transformation of milk into cheese) and salt (mostly for flavour development and also as a bit of a preservative). That’s it. 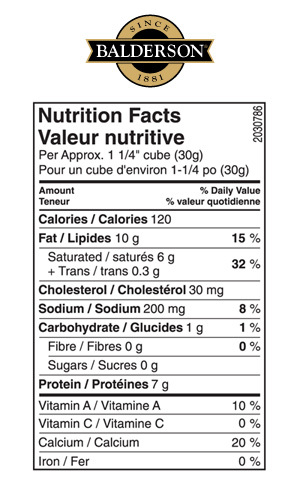 Your best guide to ingredients is the label, which will also list any additional ingredients such as modified enzymes, pepsin, modified milk substances or artificial additives. Labels will also tell you whether the cheese is certified Kosher or Halal. Balderson Cheddars, by the way, don’t have that certification because we use rennet, a calf-based enzyme, instead of a manufactured synthetic because the natural enzyme is best for making of Cheddars that are earmarked to age up to six years. I have lactose intolerance. Can I eat cheddar? The good news is: yes, you probably can. Because of the lactic acid and lactose in milk products, many people have an adverse reaction to the consumption of dairy products, including the milder cheeses. However, once a Cheddar has reached two years in age, the lactose has completely broken down and the cheese will therefore produce no bowel irritation or allergic reactions. How much cheese is in a cup? What makes different kinds of cheeses taste different? In addition to the type of milk used, any given kind of cheese you can think of has its own unique bacterial culture. It’s the culture that determines whether you end up with a Gouda, a Brie or a Cheddar. Flavour also depends on the skill and craftsmanship of the cheese makers. Cheeses can be manipulated in a variety of ways to change the flavour, shape, aroma and appearance. Another key factor is how the cheese is stored and aged. Careful aging can coax out a more complex flavour. Cheddars begin with an artful transformation from milk to milk solids to curd. Temperatures are carefully watched during these initial stages, and each block has to have just the right salt and acidity levels. We make Balderson Cheddars with a perfect combination of fresh Ottawa Valley milk, our own bacterial culture, our own rennet and a century-long tradition of cheese making techniques. None of these factors can be duplicated by any other cheese company, and the result is a truly singular Cheddar.